This Deviled Egg Keeper is the perfect size for a family get together and will be great to use during the holidays. 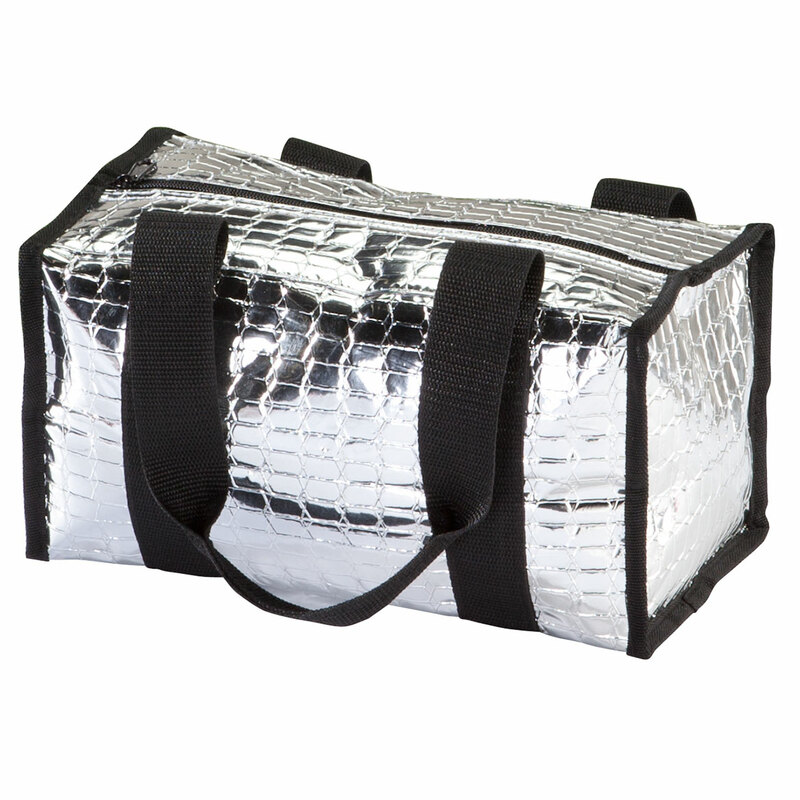 It's sturdy and air tight and the size is perfect for fitting easily into the refrigerator. I love this deviled egg keeper. I bought two, one for me, and one for my friend. We have both loved them. We use them quite frequently. They are great for storing, serving, and we are tickled to pieces with them. Love this product!! Heavy plastic construction and airtight seal just like name-brand plasticware that didn't warp after a run through the dishwasher. And for the price??? You can't beat it!! I bought a few to give as gifts, and the recipients loved them, too!! These are really nice deviled egg carriers. The only thing that could be bulit upon is that it would be nice if the containers had handles. Then they would be even more perfect. 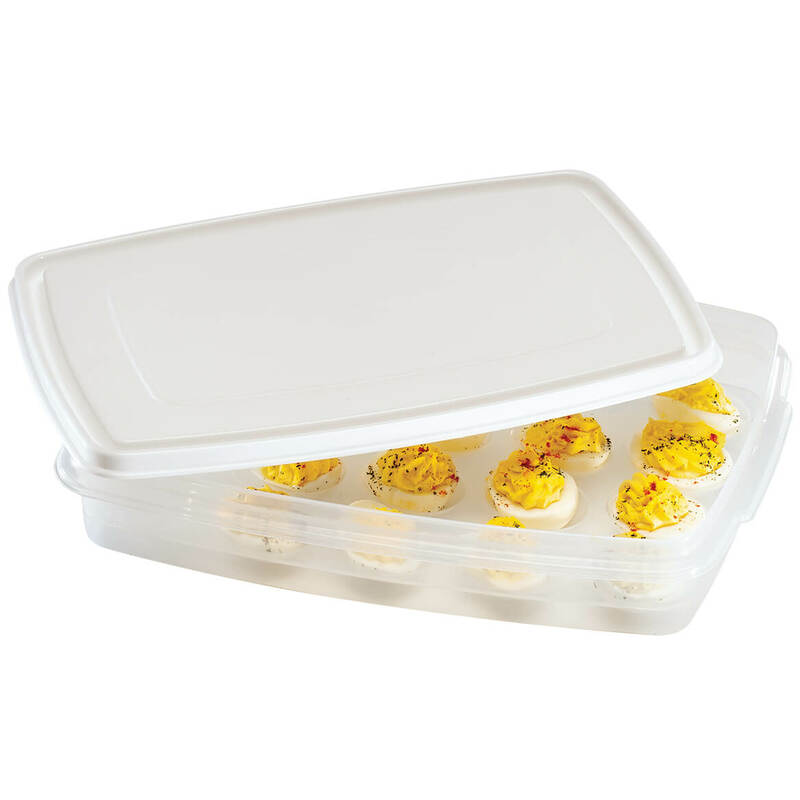 This container is great for Holidays when you have to fix deviled eggs to transport and looks great to serve on any table. Easy to put lid on and store back into refrigerator. Use every week!!! So handy. Eggs last longer without being damaged. Great for transporting your deviled eggs. No more sliding around, and is very secure. Tight fitting lid keeps eggs fresh. Great price. My family loves deviled eggs and now I finally have a convient container to carry it in! It goes from the picnic to the fridge and it is easy to clean. Ideal for taking deviled eggs to family dinners. Large enough to carry 20 eggs but doesn't take up a lot of space in the refrigerator. I have a total of six of these containers! These containers are great for travelling. My friends love my devilled eggs and are always asking me to bring them to picnics and potlucks. Leftover eggs, when there are any, go home with friends for their leftovers. They love the containers too! Make deviled eggs for parties but never had a good way to transport them. The seal is a little weak but I still love these. Needed these to carry eggs to a party! Needed them quickly and received them on time!!! Which, surprised me how quickly they came. Quality is great and unlike my other containers, the lids fit well and have no problem with them falling and lids coming off! Would definitely recommend these for everything, even just storing them in the fridge! Gave them a 5 star but would have given them a 10 if I could!!! Great for transporting deviled eggs! I have three of these. I use them for large holiday gatherings for transporting deviled eggs for a crowd. They always come home empty. I would recommend hand-washing these to protect the seal. Most useful is the efficiency when traveling as we attend many family dinners. Went to a tailgate party last year with friends and she didn't have an egg carrier. The poor slippery little devils were smashed eggs instead of deviled eggs by the time we unloaded. This is a gift for next year's tailgates. Nice looking and priced right. 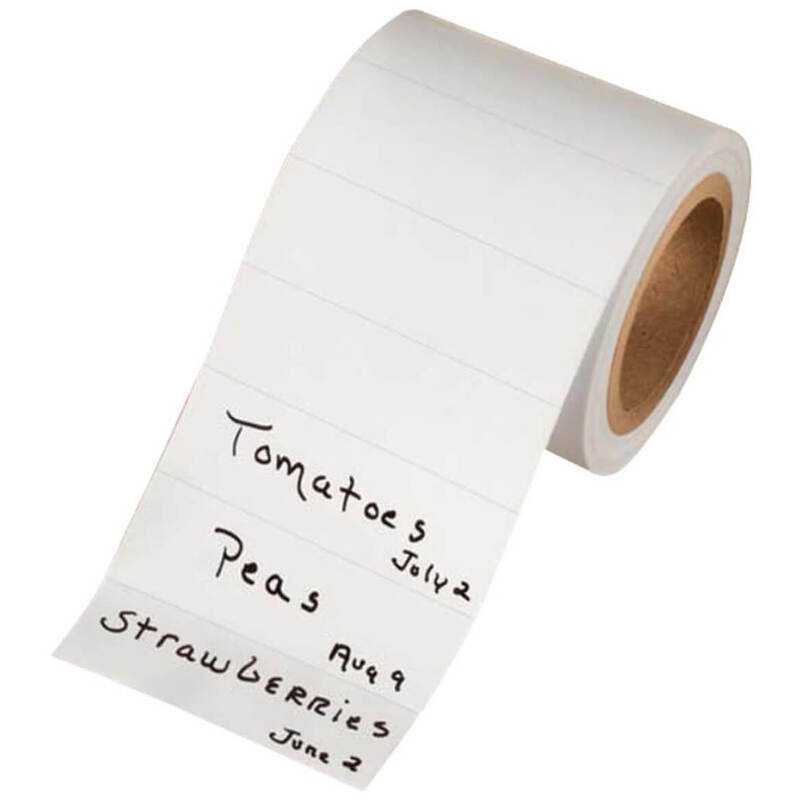 Great for picnics, parties and home use. The eggs do not slide around or stick to each other. Great for travel and stays fresh longer!! Now I have a convenient deviled egg holder! Love it! I have wanted one of these for a long time. I finally decide to get one. 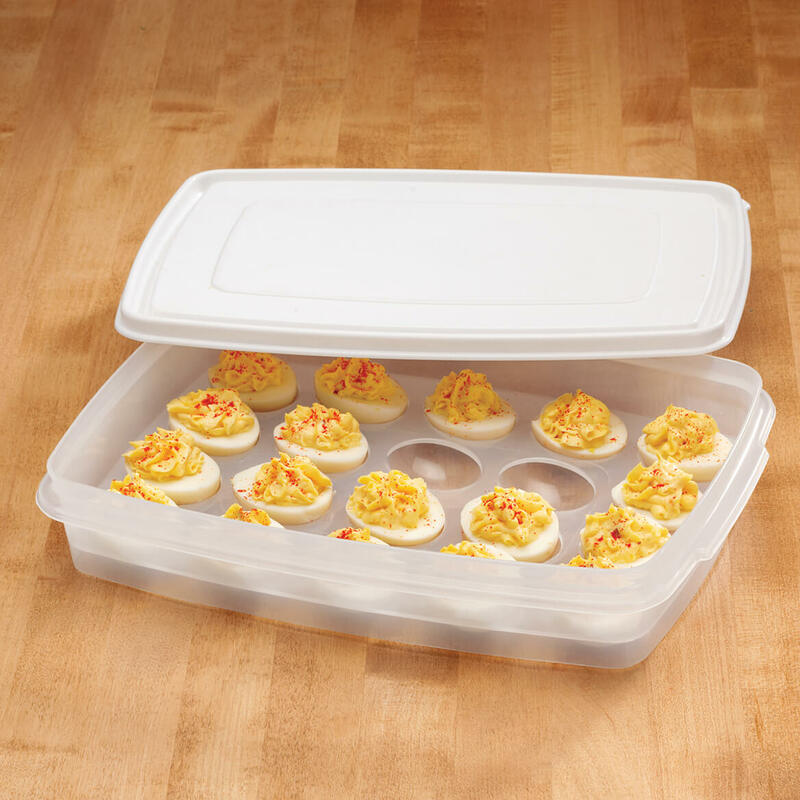 I make deviled eggs often, & this container is the perfect way to store them, & carry them to family get-togethers. The container keeps them fresh. We have a lot of fellowship meals at church and there never seems to enuf deviled eggs. I have never seen carriers before that can hold so many as these. I bought 2 so at this year's picnic we should have plenty! This is perfect for deviled eggs, holding them separately and in place; flat for traveling or keeping in refrigerator. Good deal! This was a great buy! I've looked everywhere for these! Good value too. Great for picnic's and family get togethers. I bought this product so I would be able to take my great deviled eggs to my children's functions. I already have two of these, and needed a third one. I love this egg holder, you can easily stack one on top of the other to transport many deviled eggs! don't have enough spaces for all the eggs I need to make for growing children. This is larger than most containers. I now have room for more eggs. I have had this 3 years, and it is still like new. Stores easily in and out of the fridge. Could only find glass, or ones with no lids before. It was exactly what I had been looking for. This is excellent for transporting deviled eggs, and it stores easily when not in use. Order 2. You'll need them! So nice to have tidy deviled eggs for a change. Can't wait till I have a family dinner to present them in the carrier. Currently in fridge with leftover eggs. 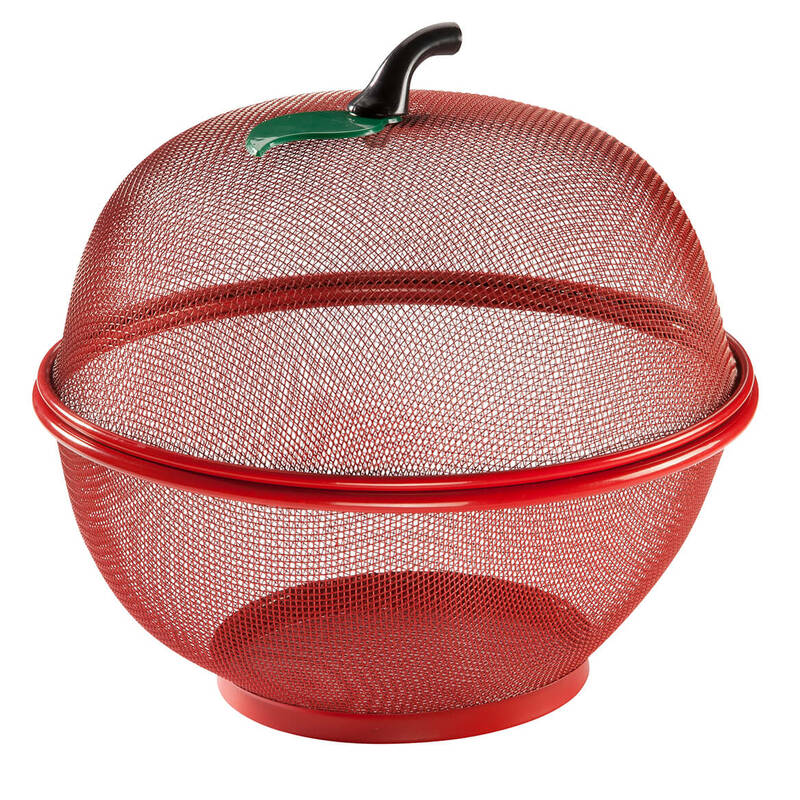 I now own two of these and use them to take deviled eggs to picnics, potlucks, etc. They are very sturdy and well made and do a great job of transporting the eggs. 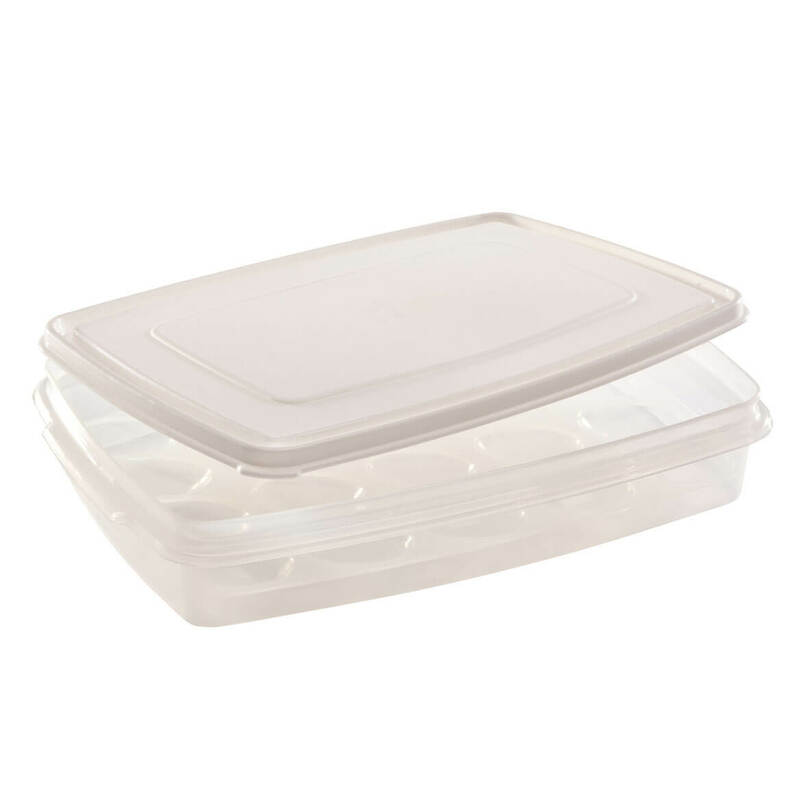 They are great ffor storage too with a nice tight lid and are stackable in the fridge. They are even attractive enough for serving. Great item and great price! have my eggs covered in the fridge instead of using the foam or paper containers they come in. This container is perfect and I will but more. Also great for carrying deviled eggs to family functions. Thank you for having a great product. These are perfect for transporting eggs. I bought two. They are stackable. Eggs stay fresher longer than another product. Very easy to open and close the lid. Eggs stay put when removing Keeper from fridge and during transport. Am thinking of buying another. Great product and great price. I've had one from Tupperware for years but they stopped making them for some reason....and my daughter wanted one and hasn't been able to find one until I seen it in your catalog. She's going to love it. This is great for deviled eggs.........great to take to pot luck dinners! Love it! WE BOUGHT 3 EGG KEEPERS... LOVE THE SIZE & SHAPE... GREAT FOR STACKING IN A COOLER WHEN TRANSPORTING TO FAMILY FUNCTIONS, PICNICS, ETC! This was perfect for my cookout this Memorial Day Weekend! I was able to have the eggs in the container on ice. I could then take back in the house and replenish. Very easy to use and convenient! Freshness guaranteed for early family gathering prepartion. Great for carrying to picnics, parties and stackable storage in fridge. Excellent Way to Store and Transport Deviled Eggs! This is a product that is a space saver and excellent storage container. This is great. It made me want to fix deviled eggs for each and every holiday. I think I'll get a lot of use out of this. My husband and son both found it easy to handle, getting in and out of shorter refrigerator shelves often. Good quality, as pictured, I would buy again. I actually have two of these. 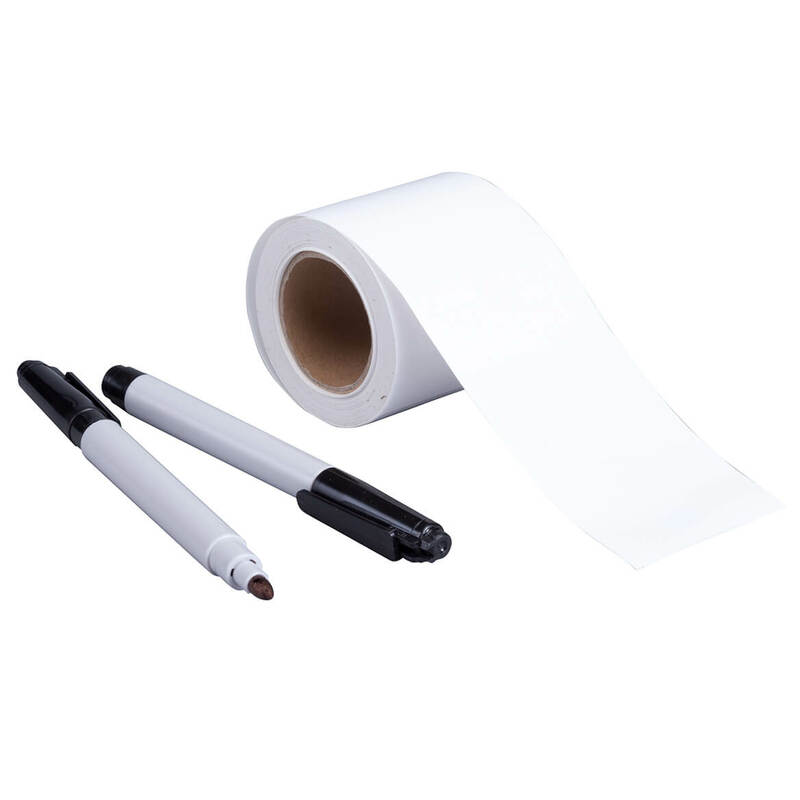 I use one for small gatherings at home and use both for large family groups. store some eggs nicely. Good item. It works as well as its advertised attributes. I wish it held a full 24 deviled eggs instead of just 20. Do you buy 10 egg cartons? We bought it for transporting to parties .... works great. Seals tight! I love the convenience of this piece! My only issue is that we all know when you make deviled eggs 12 turns into 24. This piece only allows for 20 eggs. I guess the benefit of it is that I have 4 eggs to eat for myself! :) I would prefer for them all to fit secure though, otherwise great piece! I bought 2 for myself and 2 for my daughter. We both love the convenience of storing and serving from the same container. I didn't want to spend a lot for something that we occasionally make. This price was affordable for good quality storage. My only wish is that it would accommodate 24 slots for a dozen eggs as opposed to 20, otherwise I would give it 5 stars. I know I will put it to good use. I dropped mine right out of the box and a corner of the lid broke off. It landed on a hard wood floor. It is great other than the broken lid. Eggs are easy to take along. Everything stays in its place. Would prefer a handle, but for the amount of eggs it carries, this is just fine. Great for storage of eggs also. This product is excellent for transport. Just what I needed for transporting my famous deviled eggs to family dinners. Nice dish for deviled eggs whether taking out or using at home. This container holds eggs well; however, the lid can be lifted without too much effort so I would say it's not air tight as stated. Otherwise, this product works well for short term use, such as taking eggs to picnics, gatherings, etc. Too deep--hard to get eggs out. Hard to get eggs out when serving as container too deep. I've borrowed something like this before and loved it, but this one must not be completley air tight because I noticed that my eggs started to develope a "crust" on them. wouldn't buy it again...would pay the extra money for the tupperware brand. I expected the lid to fit tightly so it was airtight but it just sits on top not sealing at all, very disappointed. I love the fact that each egg (half) fits perfectly in the individual slots and the deviled egg keeper is easy to clean. Typically when I make deviled eggs for a potluck or party, I make a dozen, which means I need 24 slots. I'm not sure why this container was made with only 20 slots. The other downside is that the lid does not seal tightly. It is extremely loose and the smell of the eggs escapes and fills the refrigerator, the entire house, and my car while transporting the eggs. I placed a rubber band around the container, but that did not help. I like this product except the lid does not fit tightly, thus it doesn't seal, that's necessary for eggs. Love these to hold my deviled eggs ... I have bought many in the past and end up giving them to my relatives and end up not having one when it comes to making my eggs for the Holidays ... I’m keeping these this time for Myself !! very convenient way for serving or transporting. Too protect our eggs when traveling! Like to fix deviled eggs with bacon bits for a quick run-out-the-door protein packed breakfast. Great way to store them. I need to carry deviled eggs to a church dinner. My sister makes the best deviled eggs and she needed a couple of containers to bring them to family functions. These work great. BECAUSE WHAT I WAS LOOKING FOR. Perfect size and has a lid to keep the eggs fresh and in place without sliding. Going to use this container for devil eggs. Was searching for the right container and this one is it! We have a big upcoming luncheon and this will allow early preparation and transport of deviled eggs. To replace a damage one. The price is right. Never have a way to carry eggs. So needed! I make a lot of deviled eggs in the summer months and love this. My boyfriend LOVE deviled eggs and I got them so they would be easy for him to carry. this makes carrying boiled eggs easy. ease of transporting to gatherings. I could not find them in any stores and they are nice to use when you are taking deviled eggs to a picnic or event. I seem to be making eggs a lot since last summer. So why not try it. I have one already nd I love it. I just wanted to have a second one. Always have a problem storing deviled eggs, this will solve that. 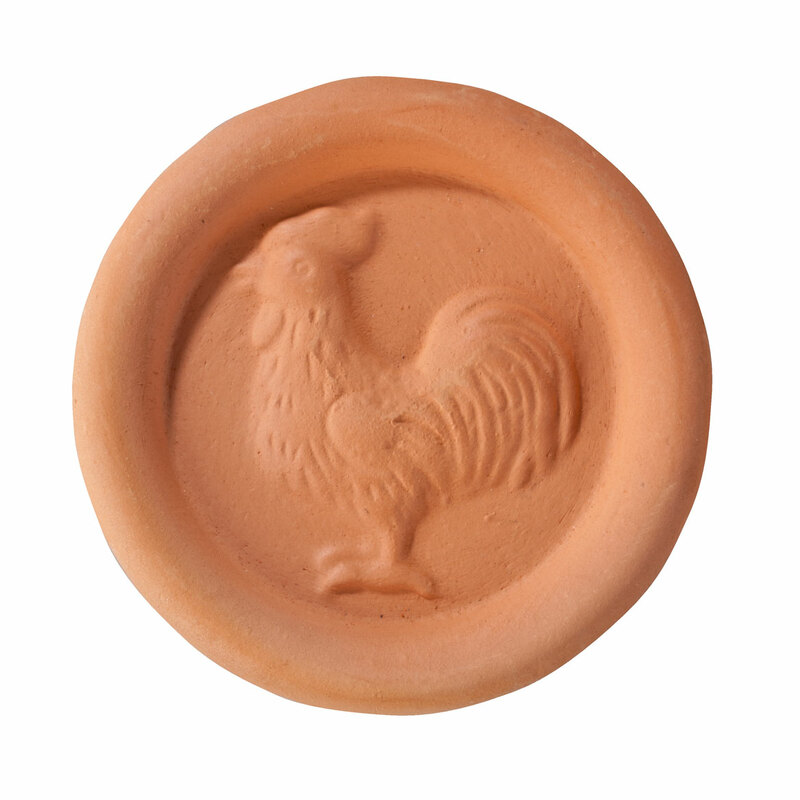 Have used this for taking deviled eggs to picnics! Travels well! Even dropped it upside down once! Not too big of a mess! Saved most of the eggs! I have been looking for another one. Will be a lot easier to transport to parties and to store in the refrigerator at home. It's an item that makes transporting deviled eggs from one place to another easy, and non-messy. We like to take deviled eggs to friend's homes and dinners away from home and have nothing to carry them in safely. This product holds more eggs than similar products I looked at.Less expensive too!! I always make too many - this helps for storage. There are only 2 of us I thought what a good way to keep deviled eggs for 2. Can I buy this item in store? BEST ANSWER: Thank you for your question. We do sell our products in stores. We hope this information will be of help to you. I can not find my order. It does not even show that I ordered anything. What do I do? Is the part where the eggs sit a separate tray that can be pulled out to wash? BEST ANSWER: It is just as the picture shows. The actual container with the egg molds is one hole unit that can fit in a dishwasher. I use the top rack. Interesting, why only 20 slots, when eggs usually come in 12 pk cartons? BEST ANSWER: Thank you for your question. Unfortunately we do not have an answer at this time. We have passed your comments along to the manufacturer. We hope this information will be of help to you. Thanks for the response. Perhaps, as you say, the manufacturer will manufacture a 20 slot container. Want deviled egg dish with lid, for 12 halves?